Seen it on nature shows but never in real life. Last Saturday morning at 9am, my wife yells to me that there is a big swarm of bugs in the yard. I have seen little swarms of tiny bugs swirling in the sun from time to time, so I just chuckled and said Yeah, Ive seen it before. She says, No this is different, whatever it is, they are big. So I look out the window to see what looks like a Tornado in the yard swirling all around a large Cyprus tree in my yard and slowly they all ended up in the tree. At first we thought there was a big nest and scrambled to find and buy the right stuff to deal with a huge nest. As they settled down I was able to get closer and realized there is no nest, and these were huge Honey Bees and they were just all hanging on each other and crawling all over each other. I did a little research online and found some pics of what looked exactly the same. It said they swarm around 9am in the morning, hang out for a day, then go off to another spot or a new nest. Early the next morning I saw some fly away in a direction I was happy with and it did not look like they were returning, but the huge swarm was still hanging there. We were busy getting ready to go someplace and at 9:15 I looked again and just like the info said, they were gone and right on time. The pic below is one of what I took while they were here. Holy crap, that's scary. I wouldn't have gone anywhere near that to take a photo. And they do look huge. Good lord. That's totally cool. May they find a good home soon! 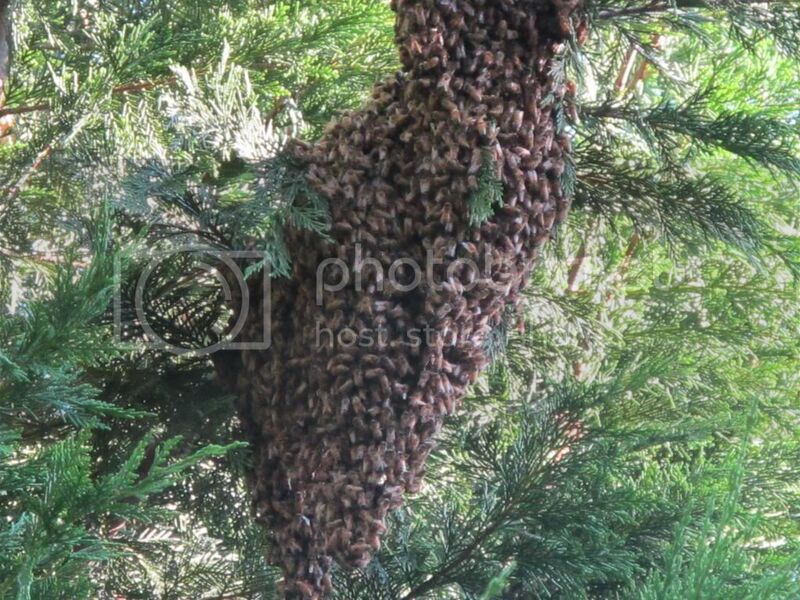 My fear would be if they decided that was a good spot to start a new beehive. I've had wasp nests on my block when I was younger but I haven't seen any in a looooong time. Still, honey bees are cool. They make the good stuff. That's very cool. But I'm glad that they moved on. My mom had honey bees build a nest in the outside wall of her house last year. When she started trying to find someone to get rid of them she was told that it's ILLEGAL to kill honey bees! She ended up connecting with a bee keeper who gave her some advice about how to get rid of them. So she took his advice and we're just waiting to see if it works. 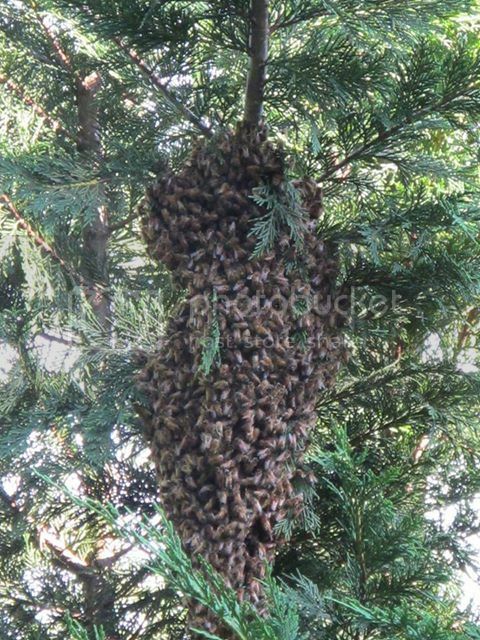 Ironically, last night on Nova Science Now, they were talking about animal intelligence and they did a whole segment on how Honey Bees swarm and then find and signal the rest as to where the new nest is. Very cool how it all works.